George, an English railway engineer, born at Wylam, Northumberland, June 9, 1781, died at Tapton park, near Chesterfield, Derbyshire, Aug. 12, 1848. For several years he was employed at various collieries as fireman, and afterward as plugman, and gradually acquired so complete a knowledge of the engine as to be able to take it apart and make any ordinary repairs. At 18 he could not read; but within two years, by attending night schools, he was able to read, write, and cipher with tolerable facility. In 1805 he removed to Killingworth colliery, and about this time was desirous of emigrating to the United States, but was unable to raise money for his passage and outfit, He continued to work in different collieries, and in his leisure hours studied mechanics and engineering, mended clocks and shoes, cut out clothes for the miners, and turned his hand to other useful occupations. His skill in repairing engines and his improvements upon old machinery led in 1812 to his appointment as enginewright at Killingworth, at a salary of £100 a year. Besides erecting a winding engine for drawing up coal, and a pumping engine, he projected and laid down a self-acting incline along the declivity of the Willington ballast quay, so arranged that full wagons descending to the vessels drew up the empty ones. But the construction of an efficient and economical locomotive steam engine mainly occupied his attention, and in July, 1814, he completed one which worked successfully on the Killingworth railway, and proved the best yet constructed. It was the first locomotive made with smooth wheels, for he rejected the contrivances which Trevithick, Blenkinsop, and others had thought necessary to secure sufficient adhesion between the wheels and the rails. While engaged in plans for an improved engine, his attention was attracted to the increase in the draught of the furnace obtained by turning the waste steam up the chimney, at first practised solely in the desire to lessen the noise caused by the escape of the steam. Hence originated the steam blast, the most important improvement in the locomotive up to that time, and it was embodied in Stephenson's next engine, completed in 1815. For some years Stephenson had been experimenting with the fire damp in the mines, and in 1815 he completed a miner's safety lamp, which is still in use in the Killingworth collieries. The invention of a safety lamp by Sir Humphry Davy was nearly simultaneous, and to him the mining proprietors presented a service of plate worth £2,000, at the same time awarding £100 to Stephenson. This led to a protracted discussion as to the priority of the invention, and in 181V Stephenson's friends presented £1,000 to him. Having brought the locomotive to a considerable degree of perfection, Stephenson next turned his attention to the improvement of railways, his opinion being that both were parts of one mechanism, and that the employment of steam carriages on common roads was impracticable. For the purpose of making railways solid and level, and preventing jerks at the junction of the rails, he took out in 1816 a patent for an improved rail and chair, and recommended the employment of heavier rails and the substitution of wrought for cast iron. In connection with these improvements he added considerably to the. lightness and strength of the locomotive, simplified the construction of the working parts, and substituted steel springs for the small cylinders on which the boiler had at first rested. His next important undertaking was the construction of a railway eight miles in length for the owners of the Het-ton colliery, which was successfully opened on Nov. 18, 1822, the level parts being traversed by five of Stephenson's locomotives, while stationary engines were employed to overcome the heavy grades. In 1820 an act of parliament was obtained for a railway between Stockton and Darlington, of which Stephenson, who made the preliminary surveys and specifications, was in 1823 appointed engineer. The line was intended to be worked by stationary engines for the steep gradients, with horse power on the level portions; but at Stephenson's urgent request the act was amended so as to permit the use of locomotives on all parts of the road, which was opened Sept. 27, 1825. In 1824, in connection with Edward Pease, he opened an establishment for the manufacture of locomotives at Newcastle-upon-Tyne. In 1825 he was appointed principal engineer of the Liverpool and Manchester line, made the preliminary surveys, and in June 1826, began the construction of the road, which employed him during the next four years. Of the engineering difficulties successfully overcome, the most important was the crossing at Chatmoss, a bog 4½ m. in length, on which the road was made to float. While this road was building, the most eminent engineers persisted in recommending stationary engines in place of locomotives, which they declared unsafe and incapable of attaining high speed; and the clumsy expedient of a series of stationary machines 1½ m. apart, dragging the trains by ropes, would have been adopted but for the energy of Stephenson and a few of his friends. He finally prevailed on the directors to offer a prize of £500 for the most effective locomotive engine for the purposes of the road; and at a trial which took place near Liverpool, Oct. 6, 1829, his engine, the Rocket, constructed by himself and his son Robert, was adjudged to be the best of the four entered, having averaged a speed of 14 m. an hour, and even attained one of 29 m. The distinguishing features of the Rocket, the first high-speed locomotive of the standard modern type, were the multitubular boiler, which was not Stephenson's invention, but was first applied by him to locomotives; the blast pipe; and the direct connection of the steam cylinders to one axle and one pair of wheels. At the opening of the road, Sept. 15, 1830, eight locomotives constructed at the Stephenson works were employed, and Mr. Huskisson, having been accidentally struck down and fatally injured by the Rocket, was conveyed in the Northumbrian, driven by George Stephenson, from Parkside to Eccles, 15 m., at the then unprecedented rate of 36 m. an hour. Stephenson was almost incessantly employed for the next 15 years on new roads, and was called three times to Belgium and once to Spain as a consulting engineer. "With his increasing wealth he also engaged extensively and profitably in coal mining and lime works, particularly in the neighborhood of Tapton park, an elegant seat in Derbyshire, where he passed his latter years. He declined the honor of knighthood. - See "Life of George Stephenson," by Samuel Smiles (8vo, London, 1857; 8th ed., including Robert Stephenson, 1864; again enlarged, 1868). Robert, a railway engineer, son of the preceding, born at Willington, near Newcastle-upon-Tyne, Oct. 16, 1803, died in London, Oct. 12, 1859. After several years' schooling at Newcastle, and a preparatory training in the collieries, he went in 1822 to the university of Edinburgh. He returned home in 1823, and accepted in 1824 an engagement as engineer in South America. In 1827, after a short tour in the United States and Canada, he returned to England, and was employed in the construction of the Liverpool and Manchester railway, and in connection with his father in the improvement of locomotives. After being engaged on several minor railway lines, ho was appointed engineer of the London and Birmingham road, which under his direction was completed in 1838; and thenceforth for many years he was almost exclusively occupied with similar undertakings at home and abroad. Among his most remarkable works are the high level bridge over the Tyne at Newcastle, the viaduct over the Tweed valley at Berwick, the Conway bridge, and above all the Britannia tubular bridge across the Menai straits. (See Bridge, vol. iii., p. 275.) He was also employed on railways in Belgium, Sweden, Norway, Italy, France, and other parts of Europe, and visited Egypt several times to superintend the construction of a road between Alexandria and Cairo, on the line of which are two tubular bridges, traversed by trains on the roof instead of the inside, as in the case of the Britannia bridge. He also designed an immense bridge across the Nile at Kaffre Azzayat, and the great Victoria tubular bridge which crosses the St. Lawrence near Montreal, and was formally opened in the summer of 1SG0. From 1847 till his death he represented the Yorkshire borough of Whitby in parliament. He was a member of several scientific bodies, received a great gold medal of honor from the French industrial exposition of 1855, and from 1855 to 1858 was president of the institute of civil engineers, He published " Description of the Locomotive Steam Engine" (4to, London, 1838); "Report on the Atmospheric Railway System" (4to, 1844); and " The Great Exhibition, its Palace and Contents" (12mo, 1851). Besides Smiles's biography, his life has been written by J. C. Jeaffreson and W. Pole (2 vols., London, 18G4). STEREOSCOPE (Gr. στερεός solid, and σκοπέν, to see), an instrument by aid of which the two eyes view two different pictures of the same object and combine them into one having the appearance of solidity. This illusion is produced by presenting to the right eye a picture which represents the object in perspective as it would appear to that eye alone, and to the left eye the picture of the object as seen by the left eye. If these two pictures exactly represent the object as seen respectively by the right and the left eye, which can readily be accomplished by means of photography, we shall, on looking into the stereoscope, receive the same impression of solidity or relief as is given when both eyes look at the real object. One who has sufficient power of directing the movements of his eyes does not need an instrument to aid him in combining the two pictures on a stereoscopic slide. It is only requireed that the right eye and the left shall be respectively directed to corresponding points on the right-hand and left-hand pictures. It is said that a stereoscope as just described was conceived by Prof. Elliot of Edinburgh in 1834, but was not constructed by him till 1839, after Sir Charles Wheatstone had in 1838 invented and exhibited his reflecting stereoscope. In Wheatstone's instrument the observer looks with his left eye into a mirror at a, fig. 1, and with his right eye into a mirror at b. These mirrors are inclined at an angle of about 45°, and hence reflect into the eyes the two pictures placed at k and g.
These pictures therefore appear at the same place behind the two mirrors, and give the observer the impression that he is looking at an object or group of objects having solidity, or the third dimension. In 1849 Sir David Brewster invented a refracting stereoscope. This is more convenient than Wheatstone's, but does not give such well defined effects as the reflecting instrument. In Brewster's stereoscope the two pictures are placed side by side, and are separated from each other by a partition, S, fig. 2, so that the right eye can only view the right-hand picture and the left eye the left-hand one. These two pictures are observed through two lenticular prisms, L and R, fig. 3, which not only slightly magnify the pictures, but also cause them to overlap each other; and thus we see in the middle of the instrument one picture which appears in relief. Fig. 1. 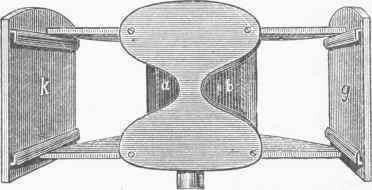 - Wheatstone's Stereoscope. Fig. 2. 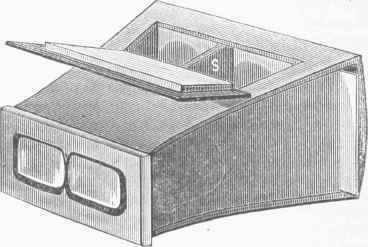 - Brewster's Stereoscope. Fig. 3. - Section of the Eye Pieces. These effects of solidity can readily be exaggerated by taking the two pictures by means of two photographic cameras, the distance between the centres of whose lenses is greater than that between the centres of the human eyes. The explanation of the illusions of the stereoscope is contained in the explanation of the fact that binocular vision gives us the perception of the third dimension of extension in all objects not over 200 ft. distant from the eyes; for in the stereoscope we have the images formed on the retina of the right eye and of the left similar to the images that would be formed in the eyes if real solid objects were before us, having the sizes and the situations that they appear to have in the stereoscopic illusion in the instrument; also, the axes of the eyes are inclined to each other in the same manner when looking in the stereoscope as they would be if they regarded the above mentioned group of solid objects. Hence the eye is affected exactly as when it views these real objects, and a stereoscopic perception is the effect. Indeed, a simple rule for all illusions of sight, as Helmholtz concisely states, is " that we always believe that we see such objects as would, under conditions of normal vision, produce the retinal image of which we are actually conscious." The reason that a stereoscopic perception is obtained when we look at a near object is due to the fact that the impressions produced by the two different pictures of this object on the retina, and the muscular adjustment of the ocular axes so that they converge to the same point of the object, are translated, through the experience of touch, as effects belonging to solidity. Some have imagined that they had explained stereoscopic perception by the fact that the axes of the eyes converge to point after point on the object in rapid succession, and thus, as it were, triangulate the positions of these points by a series of visual triangles, which have for their base the distance separating the yellow spots, or maculoe luteoe, on the retinas of the eyes (see Eye, fig. 1), and for sides the lines drawn from these soots to the various observed points of the object. But Dove showed that the stereoscopic perception is obtained when we illuminate the pictures in the stereoscope by the flash of a Leyden Jar; and Prof. Rood has shown that the duration of this illumination is only four billionths of a second, a duration altogether too short to allow the eyes time to make any motion. Others have maintained that a combination of the impressions produced upon both retinas takes place, and thus the two plane retinal pictures are fused into a stereoscopic perception; but the retinal impressions do not combine, for Dove has shown that when dull black is alone viewed with one eye, while white is regarded with the other, the perception produced is similar to that of the metallic surface of graphite; whereas the real combined sensation of these impressions is a dull gray. From these and many other experiments we learn that "two distinct sensations are transmitted from the two eyes, and reach the consciousness at the same time and without coalescing; that accordingly the combination of these two sensations into the single picture of the external world of which we are conscious in ordinary vision is not produced by any anatomical mechanism of sensation, but by a mental act." - See "The Stereoscope," by Sir David Brewster (London, 1856), and "Recent Progress of the Theory of Vision," by Helmholtz, published in his "Popular Lectures on Scientific Subjects"(New York, 1874).